One reason I love the holidays is that they mark the beginning of the Dungeness crab season. This tasty treat is harvested from mid November to the end of June, along the Pacific coast from Santa Barbara to as far as the Aleutian Islands in the Bering Sea. Being simply cooked in boiling water, its meat is sweet, tender, and slightly nutty. It is, I think, my favorite crustacean and the way I like it best is with just a squeeze of lemon, some bread and butter, and a glass of dry, mineral-driven, white wine. So the other day, we ate our first crab of the year with some delicious 2010 Geyerhof Grüner Veltliner Rosensteig. Grüner Veltliner is Austria’s national grape, accounting for more than 30 percent of the country’s vineyards and it is at its best along the Danube river were it grows in terraced vineyards on slopes so steep they can barely retain the soil, producing mineral-driven wines that can age well. The Geyerhof winery is situated on the southern slopes of the Danube Valley east of Krems. The owners, Josef and Ilse Maier, have 15 hectares of dry-farmed vineyards on loess, sand and tertiary gravel soils and produce mostly Grüner Veltliner and Riesling. 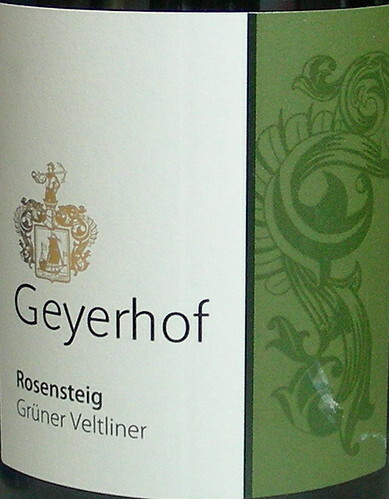 The fruit of the Grüner Veltliner Rosensteig comes from the organically farmed Rosensteig vineyard and has been manually harvested. The wine had a light golden color with aromas of Granny Smith apple and peach on the nose. On the palate, it was crisp, mineral, well structured, with notes of lime and paprika on the finish. I am looking forward to some more Dungeness crabs this season and some more Grüner Veltliner as well!